My executive coaching client, Sonya, was head of the Operations function in her organization when her boss was struck with a severe illness that forced him to suddenly quit his job. As a result, Sonya was catapulted overnight to the role of General Manager. She went from being peers with her fellow function heads to becoming their boss. And some of them weren’t exactly happy about that. To make the situation more challenging, Sonya had been raised in an Asian culture where harmony is a critical value and a key to success in work and life. On the other hand, the function heads now reporting to her came from mixed backgrounds, but quite a few from Western cultures. Harmony wasn’t as important for them, so her leadership meetings were a struggle from the start, with considerable conflict and all sorts of games being played. Because of Sonya’s desire to maintain a pleasant environment and make sure people were happy, her efforts at placating everyone didn’t resolve issues. In fact, some of her team members didn’t take her seriously, and the tensions between them persisted. She came to me in a state of desperation, needing help to find a solution. I had a hunch that Sonya might benefit from exploring her mindset around conflict. So, the first thing we did was use what I call the “What You Think is What You Get Triangle,” starting from the bottom and working our way up. “I gloss over it when someone objects to something I say or do. I just turn away from dissent, or I agree with that person, even if I don’t really agree,” she answered. Through doing this exercise, Sonya began to realize that it was her own thinking and the resulting behaviors she exhibited—not the actions of her colleagues—that were actually keeping conflict alive. We tend to think of conflict as problems with “other” people, and we look for ways to change their behavior. But managing conflict is largely an “inside job,” a matter of self-leadership. Sure, your negotiating skills and everything else you’ve learned about working with others will come into play, but your self-leadership skills will set both a tone and an example. 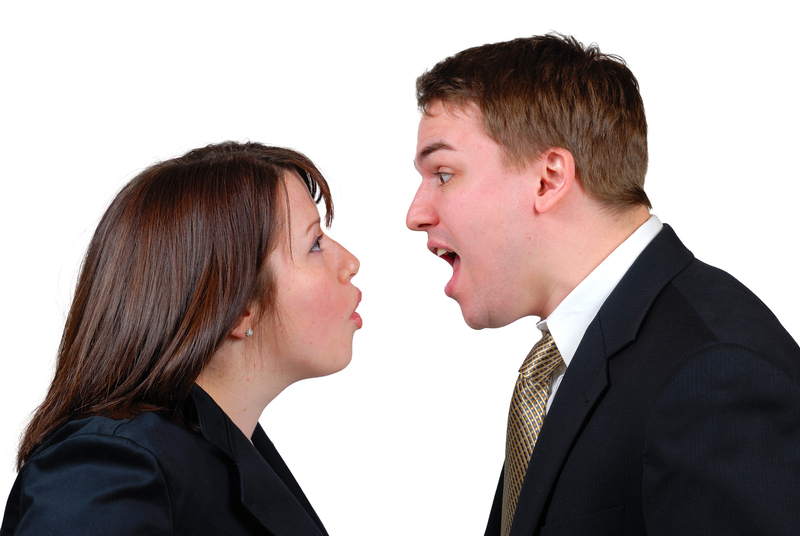 The better you manage yourself, the better each conflict that arises will be managed overall. 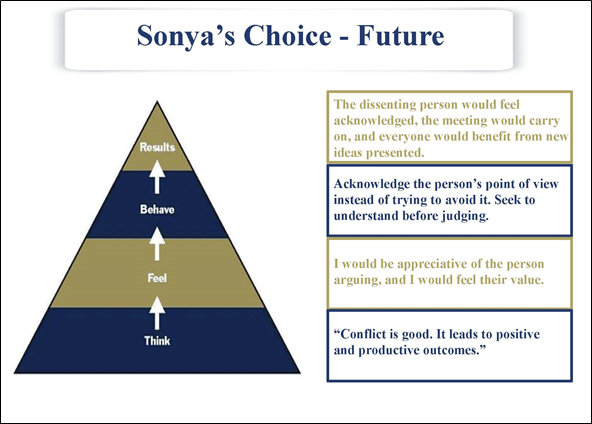 When I asked Sonya to reflect on the overall impact of her behavior on her individual brand as a leader, she admitted it probably made her appear ineffective and that conflict management was an area she could definitely work on as a way to strengthen her self-leadership. Regardless of the culture we come from, let’s face it: Few of us actually enjoy arguments. They can be unpleasant and give us anxiety because, if they escalate, we might damage a relationship or create bad feelings that linger. Once people feel hurt or insulted, it isn’t always easy to regain their trust or respect. a clearing of the air so that issues don’t fester. A modern-day example of how arguments can bring about positive outcomes is the relationship between Bill Gates and Steve Jobs. They had a famous, history-making argument that led them to launch two separate companies. Without that argument, we might not have the products we use every day from Microsoft and Apple. If you tend to avoid arguments (and many of us do), try the “What You Think is What You Get Triangle.” Start at the bottom of the Triangle, and work upward, asking yourself what you honestly think about arguments, how that specific thought makes you feel, how that feeling in turn influences your behaviors, and what the outcomes are of those behaviors. In short, reflect on how those behaviors impact your brand as a leader. Then, you’ll see how that single, foundational thought that you have around conflict ultimately impacts the results you get. Once done, redo your triangle, thinking a productive thought about arguments, how that thought would make you feel, how that feeling would make you behave, and the results that you would get from that new behavior. It’s a powerful shift. 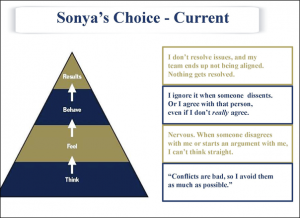 Here’s how that second triangle turned out for Sonya: In order to alter her results, we went back to the beginning and considered how the outcome would change if she modified the way she thought about conflict, keeping in mind that what you think is what you get. We continued on to reveal that this feeling, in turn, would cause Sonya to behave differently from before. She would acknowledge the person’s point of view instead of trying to avoid it. She would seek to understand before judging. The ultimate result? The dissenting person would feel acknowledged, the meeting would carry on, and everyone would benefit from new ideas being shared. Through this exercise, by simply changing the way Sonya thought about conflict—which in turn would shift her feelings and behaviors about conflict—she could immediately get better results. In other words, by practicing good self-leadership whenever tensions arose, Sonya would strengthen her leadership brand. Make a commitment to yourself that the next time a conflict or argument arises in the workplace, you’ll think differently about that conflict in order to get better outcomes. It’s what great self-leaders do. Do you want to strengthen your self-leadership skills? Check out my latest book, Leading YOU™: The Power of Self-Leadership to Build Your Executive Brand and Drive Career Success, where I share dozens of tips, tools, and techniques to help you rise to the top in your career. This entry was posted on Friday, March 10th, 2017 and is filed under Coaching, Leadership, Personal Branding. The way in which we utilize and perceive words drastically changes the desired/undesired outcomes and it happens more than we realize. “but” comes into play the immediate reaction is to go on the offensive. “But” conjures up visions of disagreement. Replace “but” with “and” and there is a formula for agreeance in play. “And” recognizes that you understand what they have said and would like to add to it. The same thinking can be applied to your example above Brenda. Instead of thinking about the way in which something might offend someone, think about the way it might benefit both parties involved. I am curious to know if the pyramid is something that you developed or have you used it from somewhere else? Do you mind if I use it as well? Thank you for your note, Joel – much appreciated! and, yes, I agree completely – instead of focusing on the drama and problems (the “you vs. me” scenario), it’s always best to focus on the bigger “we” – aiming toward a common goal, in terms of how we think and speak. Thank you again. As for the Pyramid model, the concept is based on Cognitive Behavioral Therapy. I have adapted it over the years to create the model I have now, but that is the foundation.